I’ve been a big fan of Costco but lately I am starting to have serious doubts about their entire business model and practices. The latest thing may not be Costco’s fault or then again maybe it is so let’s run through what happened and you decide. At least one traveler in my stateroom has cruised before. So I clicked that little box and was hoping to get a better deal but boy was I disappointed. 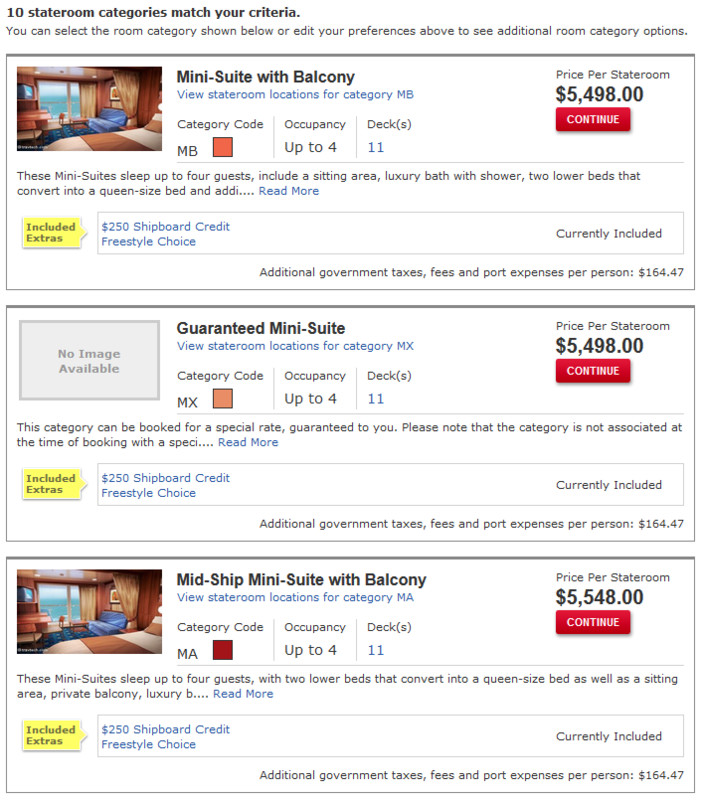 The prices for the exact same cruise actually INCREASED! The prices essentially went up $500 for being a loyal customer! 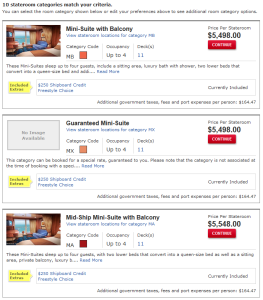 At first I thought maybe the price of the cruise had just gone up due to demand but I cleared my cookies on my browser and started the search again WITHOUT clicking the “At least one traveler in my stateroom has cruised before” button and got the same low prices as before. I’m not sure who is to blame here, Costco or Norwegian for trying to scam customers like this but it certainly isn’t right. 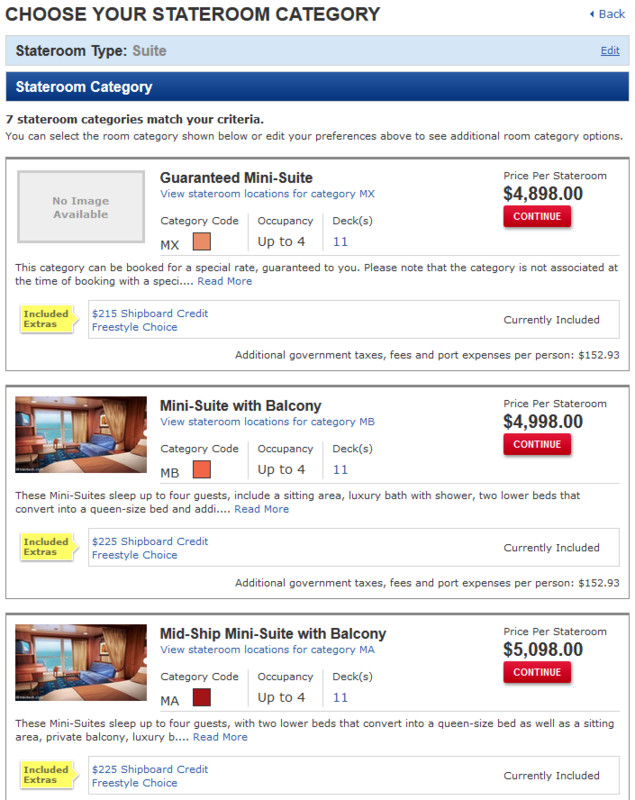 As of right now, I feel disgusted by the whole thing and will probably just decide to do a river cruise with another outfit altogether (and NOT book through Costco) but it just goes to show you that it pays to do multiple searches in multiple ways to get the best deal. Sorry Costco but I think you’re starting to get downright lazy in not looking out for the best interests of your customers. I’ve had other issues with Costco that I may write about later but for now we’ll call this issue strike one. 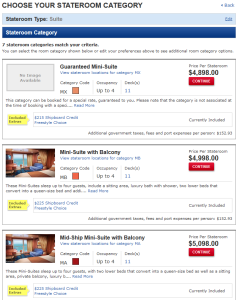 I just had the most mind blowing experience with Bluebird American Express. I have finally spoken to the world’s dumbest customer service rep in the world! A few weeks ago, I decided to do a sweep of my Bluebird account and have the funds send directly to me. Since there is a fee for taking money out using an ATM and since there is usually so low dollar limit like $300 or so, I usually opt to take $1000 or more at a time by writing myself a check through BillPay. Well it’s been two weeks and the bill has yet to arrive so I called up to find out where the check is and the agent was quite literally the world’s most stupid person. She insisted the check would have gone out and been received within 1 to 2 business days and I kept telling her that was not humanly possible because the address was a residential address and not a business much less an electronic funds transfer. The agent could not conceptually understand these basic components of banking and how money moves from point A to point B. I even tried to walk her through how if a check or any piece of paper is mailed out of New York to say Arizona or New Mexico, it cannot possibly get there in one day or two using the regular mail system. If you’re using FedEx or overnight service, of course, but not if you’re using the USPS without paying some hefty fees which I doubt Amex does to send a check out. I ended up wasting 20 minutes with her on the phone and was no better off than I was when I started the conversation. I’m going to wait a few more days to see if the check arrives but if it doesn’t I’ll need to put a stop payment on it and I’m dreading how long that will take with these brain dead agents on the phone. I was excited when this service first got started primarily as a way to transfer funds to my kids accounts but I’m probably going to end up closing all my accounts after I clean up this mess. I just can’t trust my money with a bunch of idiots. This is very surprising given it’s Amex but it is a product targeted for the “Walmart” shopper and not higher income individuals so maybe I should have avoided it altogether the way I avoid Walmart. I feel sorry for the poor people that use this service and may have difficulty with English because the rep was so stupid that anyone with even a small problem with English would have no way of communicating with the rep! This is a Public Service Announcement: Stay the HELL away from KeeperSecurity.com. Here’s the story…. For the past couple of years, I’ve been keeping my password set on my iPad on an app called Keeper HD. The app worked well and I kept it up to date regularly. Well a couple of weeks ago, the app stopped working cold. No notice, no rhyme or reason why the app stopped working but it stopped working. You can read the comments here and this was once a 4/5 star app but it’s dropping fast and within the next month it will probably be a one star app and this group of idiots will end up filing for bankruptcy. So what I’ve been able to piece together….the company decided they wanted to force everyone to mandatorily provide an email and create an online account for their “service” and subsequently disabled/killed/messed up the old application in iTunes leaving hundreds if not more stranded and unable to access hundreds of passwords. Hey, it’s a free app so what did you expect? No support, No help, No care in the world because it was a FREE app and you get what you pay for right? Essentially, if you were using this app to manage your passwords you are now officially screwed. I have started the slow painful process of manually recovering password by visiting websites and going through those annoying questions and answer sessions x 100 times. There is an old saying, “Burn me once, shame on you, burn me twice, shame on me” so consider this a fair warning about this or any other FREE app you may be using to secure your passwords. Also be weary of a company that insists on storing your passwords in the cloud – haven’t there already been dozens of reported hacking incidents into credit cards, banks, and other “secure” cloud spaces and now I’m supposed to store my passwords there? Get real! Comments Off on Do Not Order Glasses From Zenni Optical! After many decades of better than normal vision, I am now finally in need of glasses. I actually bought a pair of nice reading glasses a couple of years ago through my optometrist and was just SHOCKED to learn the glasses I ordered were $600. While insurance paid for most of it, I thought it was still ridiculous that glasses should cost $600 so I decided I would search for a cheaper alternative online. I ended up finding several low cost internet shops and settled on Zenni Optical for their somewhat good reviews. Big Mistake! While the glasses only cost me $70, they are barely useable. There is a large distortion on both lenses. I complained to Zenni Optical and they did give me an RMA number but when I recently got the glasses back, they’re still unusable. This is after waiting weeks for the first bad lenses to arrive only to follow that up with several more weeks of waiting for the same horrible lenses. I am wearing them right now and I might as well be looking through Coke bottles. Lessons learned here is don’t get ripped off by low cost glasses. I’ll probably just go to Costco next time and get a new pair from their through my insurance program. The latest travesty from the IRS seems to be limiting 401k contributions to the same amount as last year at $17,500 with no adjustments for inflation. Did I miss something where inflation was put on hold this year? The overall trend does not bode well for the average retiree. The IRS limits are trending downward not in favor of the average worker when factored against inflation for the last four years. For 2014 the variance from $18,266 to $17,500 is $767 in income excluded from 401k contribution on an inflation adjusted basis. So now let’s take a look at the social security wage limits. Interestingly, if I take the 2005 amount of $90,000 and apply a 3 pct inflation adjustment, The 2014 value is magically $117,430. It seems when it comes to social security income taxes inflation is alive and well! When it comes to helping taxpayers save money using 401k, the US government screws the taxpayer. When it comes to taking money for social security, the US government screws taxpayers yet again. And now you know why I won’t be voting for donkeys next election cycle! Why You Should Prepare Now For The Upcoming Market Crash! It is with near mathematical certainty that the stock market is going to crash and crash hard in the near future. The Fed continues to pump money and talk of QE2 and QE3 ad infinitum. Just ask yourself one thing: What is going to happen when the funny money spigot is shut off? The ONLY thing supporting this stock market is essentially free money the fed is pumping into the economy which gets recycled back into the financial markets to support more paper. It’s all totally worthless or at the very least worth less than it should be now. I consider the market recovery from when the Dow crashed down to 6000 a blessing but the recent recovery is not sustainable by any measure. I have been slowly cashing out at every opportunity while continuing to sell short the market. Yes, the Dow may rise and even hit 12k or above again and it may as the Fed continues to pump money but at some point, it is going to get real, very real for everyone and those that aren’t preparing are going to hurt the most. Quite a few people I know have cashed out and I plan on using my next employer bonus to pay off remaining debt and shoring up savings and emergency funds. I remain mostly in cash with a few exceptions such as commodities to hedge against inflation or a hard crash. If you recall from December 2008, the Fed was injecting money into the “system” back then and by March the Dow had crashed down to 6k. We’re in December 2010 and the Fed continues to pump money into the “system” yet again. I won’t go so far as to say March is when the next crash will hit because QE3 may be right around the corner but rest assured I think there are greater odds of the Mayan end of the world prophecy to come true than for a miraculous economic recovery. Oh well the Mayans end date was December 2012 so we’re only two years away! Costco, I Wish I Knew How To Quit You! Comments Off on Costco, I Wish I Knew How To Quit You! So Costco does it again and doesn’t let me down. A few days ago I bought a $300 New Zealand wool rug and today I got Costco coupons for $60 off the same rug! Went into Costco and asked for a credit and was given one with no hassles! I love Costco! I wish I knew how to quit you beautiful! I also have bought about $1,500 worth of wine over the past few months rebuilding my inventory that was depleted during my six month involuntary vacation from my previous employer. I currently have a total of 130 bottles of delicious Malbecs, precocious Merlots, titillating Rieslings, sultry Cabernets, and sassy sauvignon blancs. I had my kids do a count twice because I wanted to know precisely when I would run out of wine assuming two wine bottles per week and wanted to make sure I had at least a one year inventory. 52 weeks x 2 bottles = 104 bottles plus a few extras for guests and emergencies. With the economy starting to sour again, I’m ready for the next layoff…nay…I am taunting the world for the next layoff. Bring it on! Seriously, I’ve noted that a few of my exec peers that had been let go, found jobs are being let go again so that doesn’t bode well. It’s the canary in the coal mine and with unemployment benefits not looking promising for renewal, we could be in for a world of hurt. Stock up on food, silver, gold, and extra cash cuz we’re in for a LONG winter chaps. Are You Ready For One More Bubble? Comments Off on Are You Ready For One More Bubble? The Fed announced a $600 billion dollar planned Treasury purchase and may decide to pump more money if “necessary” in the future. This essentially now lays the groundwork for the next bubble. The Dow is already showing signs of resurrection as it soared to 11.5k and while there may be a few pull backs I have no doubt we’re on our way to Dow 12k and maybe 13k. I also have no doubt that all bubbles end in only one way: hard crash. So the only obvious question that is begged here is when to get out? Dow 12k or 13k or maybe tempt fate and try to ride it all the way to Dow 14k? This will be my last ride up and I suspect it may be a ride through December 2012 but I have no plans on “investing for the long term” in the Wall Street Casino. There are just too many baby boomers that are starved for cash and whatever money they have in the “market” will simply be pulled out over the next decade. Generation Y and below is saddled with poor job prospects and trying to get by TODAY much less planning for 40 years into the future. Generation X is a bit disillusioned and trying to find their footing as the crash of 87, 2001, 2007 have left a bitter taste in their mouth. So there you have it from Boomers to Millenials, the stock market is dead. You’re all getting one last ride; Enjoy it; Profit from it; Cash out before the fall. In the pit of my stomach, I knew it was coming and I’m sorry to see it finally arrive. What am I talking about? The desperate stories of some of my friends, peers and even strangers that have still not found work after being laid off for months or in some instances years. Here are a few quotes from people I’ve spoken to over the past couple of weeks. I know it is only a matter of time before these people will tap me for money. A few will be too proud to ask for money and will likely end up suffering the humiliation of being homeless, living out of a car or ending up in a shelter and a few won’t be too proud and ask for money and try to make a go of it but putting a band aid on a severed limb will only provide superficial help. Ironically and what infuriates me to no end are these planned “shopping” trips that a few of my relatives are planning for the X-mas season. Yeah, that’s right, despite the horrible economy, potential for total financial collapse, there are people I know out there that are still interested in buying crap at outlet malls or other places to exchange gifts. Oh well, I guess if no one buys anything the economy will worsen so maybe shopping is a good thing but crap is still crap. Like I’ve written before, either you are employed and doing the work of three people or you are unemployed with little or no prospect because someone is doing your job for you.